Click any picture to englarge. 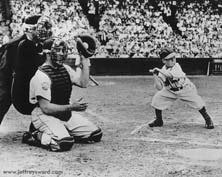 Eddie Gaedel was catapulted into baseball immortality in 1951 by imaginative manager Bill Veeck of the St. Louis Browns. Veeck signed Eddie Gaedel to a major league contract for $100. In the ninth inning of a tied game, Veeck sent Gaedel in as a pinch hitter. Being just 3'7" tall, Gaedel was walked unintentionally on four pitches. Gaedel was subsequently replaced by a pinch runner. The umpire would not let Gaedel bat until Veeck showed the umpire Gaedel's contract. There was no height requirement in major league baseball in 1951. 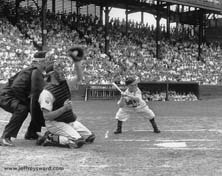 One day after the Eddie Gaedel event, a minimum height requirement was enacted in major league baseball. Bill Veeck's reported instructions to Eddie Gaedel included: "I will be on the roof of the dugout with a rifle. If you even think about swinging, I will shoot you." Several St. Louis Browns players were interviewed after the event. The consensus was that upon arriving in the dugout they noticed a dwarf in a uniform with number #1/8 and a toy souvenir bat. Since Bill Veeck was noted for creativity, the presence of a dwarf was regarded as a normal unnoteworthy Veeck occurrence. *** All time professional major league baseball records.